There are a few money topics that are more significant than others – that might be deal breakers on a marriage. I wouldn’t start by asking those on the first date. Ease into the topic by addressing issues that need to be known but most likely wouldn’t stop you from marrying that person. Here are the 10 money questions I’d ask (in increasing order of significance) and why they should be addressed at some point before you’re married. While important to know, the answers to these money questions wouldn’t necessarily keep me from marrying someone. They are designed to look into a person’s background and get a big picture overview of how they view money. 10. How did your family (parents) handle money? Why this is important: Consider this a background check of sorts. Our habits are based on years of experience and we gain much of that experience from our parents (and to a lesser degree the extended family). How we saw them handle money (the good and the bad) has a great deal of impact on our own money views. It may also help expose any current relational issues that might be a detriment. Some parents continue to be enmeshed in the lives of their adult children and use money to manipulate them. It’s a parent-child-boundary issue you’ll want to explore. 9. How interested are you in managing money? Why this is important: This is all about division of labor within a marriage. In other words, who is going to take the lead in managing the finances? Someone is going to drive the day-to-day finances and it’s important to sort that out ahead of time. Now both will ultimately have to be involved and have input with the money decisions. But one partner may have more of a natural bent towards numbers and/or have more time on their hands to deal with it. They should be the one setting up the budget, paying the bills, and keeping track of investments. 8. What do you consider a big financial decision? Why this is important: With this question you are addressing the thought process behind spending. I think we would all agree that couples should be on the same page when it comes to purchases. However, we may view the heftiness of the price tag differently. For example, I may see a big financial decision as one that costs $250. Any item at or above that price and I’d want to consult with my wife before buying it. My wife on the other hand may have a completely different number in mind. What if hers is $50? What if it’s $700? You can see the potential for disagreement here. If she comes home with a $700 item that I didn’t know about we’re going to have a come-to-Jesus discussion. If that happens routinely it will eat away at a marriage. 7. What does a financial crisis look like to you? Why this is important: Here you are gauging each other’s ability to handle financial stress. There will definitely be some in your marriage. The bigger the stresses the bigger chance for conflict. We all respond to circumstances differently. When I’m late to a function I get really stressed out. My wife takes it more in stride. You may cringe at the thought of not paying off a credit card at the end of the month. Your partner may not start sweating bullets until the creditors start to call. That’s a big difference in the amount of stress endured before action is taken. 6. Do you value experiences or things? Why this is important: With this question you are beginning to understand priorities. That will be important as you begin to plan your financial goals (see #3). What you value will determine where your money goes. Those who value experiences are looking to build memories. They will want to put their money towards events, vacations, kid’s youth programs and nights on the town. An individual who values things will want to buy stuff. New living room furniture will be more interesting than concert tickets. A house addition will be more appealing to them than a cruise. They’ll likely be the one more enthused about growing their net worth through saving and investing. There is no right answer with this question (or most of these for that matter). You can see though the potential for this to cause problems in a marriage as couples decide where to allocate their funds. 5. What’s the status of your credit report? Why this is important: This is the first nuts and bolts question on the list. It may seem like an odd question and taken by itself is unimportant. I would never forgo marriage based solely on a low credit score. A bad credit score on the other hand is a different story. “Low” could mean low because they have established very little credit. “Bad” means it’s low because of poor choices. Those choices need to be sorted out and you need to be convinced they won’t continue in the future. Your partner’s poor choices in the past won’t affect your personal credit score. Where this comes back to bite you is when you apply for joint credit, say to take out a loan for a home. It will be better to know what bad credit issues you’ll be facing ahead of time instead of finding out when you’re denied for that line of credit you’d been planning for. 4. Are you a spender or a saver? Why this is important: Again there is no right or wrong answer here. You are trying to find out your partner’s style when it comes to handling money. Is he or she more apt to hold onto it (save) or spend whatever comes in contact with their fingers? I’m a natural spender (who has learned to save). My wife is a natural saver (who has learned to spend). We coexist well together but it’s taken us some time. I wish I’d known her tendencies (as well as my own) sooner in our marriage. Questions 4-10 lay the groundwork for the serious money questions that lie ahead. You may find a few differences in questions 4-10 that you are OK to live with. I wouldn’t consider someone’s answer to any one of those money questions to be a reason not to get married (although if I were different on 5 or 6 of them that might raise a red flag). Not so with these last three money questions. Any one of these is a deal breaker in and of itself. If you can’t agree on these you shouldn’t get married…it’s that simple. Why this is important: Why would you marry someone who had different financial goals than you? I don’t mean goals like one wants to earn a living as a CEO and one wants to be a teacher. I mean goals that are different that don’t align with your other values. Say one wants to become a millionaire. To the other, that doesn’t matter. Those compete against one another. While the wants-to-be-millionaire is working 70 hours a week and climbing the corporate ladder, their partner may be expecting them to be at home and engaged in family affairs. Those two people can live together if they agree on expectations. If the teacher is fine with the partner working 70 hours a week then there isn’t an issue. It’s a recipe for disaster though if the expectations conflict. Short, mid and long-range goals should be discussed and agreed upon ahead of time. Find out where your partner wants to be financially five, ten or twenty years down the road and evaluate whether or not you’d be OK with that and what it’s going to take to get there. 2. Should we have joint or separate bank accounts? Why this is important: What an odd question to have at #2. Why would it matter if a couple has a joint or separate bank account? But it will cause conflict if one partner wants to have a separate account and the other believes joint is the best, especially if one person reluctantly caves over the issue. For example, take a wife who believes in joint accounts but is married to a man who insists they be separate. She gives in and allows him to open accounts in his name and others in hers. What’s just happened here? She gave in on something she really valued and doesn’t agree with. She has the chance to immediately resent this. She will feel not only financially separated from her husband but emotionally separated as well. She won’t feel like they are working as a team and could even begin to suspect he’s hiding things from her. How would she know? It’s his account. This is more than a nuts-and-bolts issue. It’s about transparency, working together and being one in thought and practice. Isn’t that what marriage should be in all areas? 1. Do you believe in using debt? Why this is important: Of all the money questions listed, this is the most important. While bringing debt into a marriage is only a marginal concern (meaning I’d be OK marrying someone with debt), how your partner plans to use debt in the future is a big issue. People who view debt differently should not get married. Some view debt as a tool. They’ll use debt for all their daily purchases (using credit cards), to go to school and to buy a home. To them, using debt is a way to pay for items they want (or need) now with the hopes of paying it back in the future. Others use cash or a debit card. They look to cash flow or save for purchases. For them there is great danger in going into debt and they’d rather delay their gratification and purchase an item when they are financially ready. These two people can’t happily exist. There will be constant bickering on how to manage their finances. One will want to use debt for everything while the other won’t. Major, important values are conflicting. Eventually one party will get tired of it and leave. I know this is going to be really tough especially when factoring in feelings. Love causes us to do some crazy things including looking over and past warning signs that should be obvious. In issues related to money you cannot afford to do that. It would be better to not get married than enter into that agreement with major differences over money. If you overlook the differences and say “Oh, I’ll change him/her later” you’ll only be setting yourself up for trouble. We tend to get more set in our ways with age, not embracing change. Of course the closer you are in agreement over these money questions the better chance you have of a fulfilling marriage. As I said the top three are deal breakers. The others will have to be weighed accordingly using your own judgment and wisdom. Questions: How do you feel about the money questions and their ranking in importance? Would you add any questions to the list? Did you talk deeply about money with your partner before you were married? Did any differences surface after marriage that you were forced to deal with? Pleasantly surprise we’ve talked about pretty much all of these in one way or another naturally. Two years and counting 🙂 I agree one should know these things about his or her her partner ESPECIALLY before getting married. “…before getting married.” It just helps reduce the chances of conflict after marriage so much. To go in blind about how your partner feels about money related issues is just asking for trouble. These are all great points! Money was a huge driver in my parents’ divorce, so The Fiance and I made sure we discussed these things before taking the next step. Oh my goodness, so true. Luckily, my husband and I are 100% on the same page when it comes to money. I could not imagine how stressful it would be if this were not the case. I would highly recommend that couples discuss this list before marriage…and talk about whether they would like children! This post is so great, Brian! I agree with you that it’s extremely important for couples to have these important financial talks before they get married (and before they fall in love if they can help it)! It will make things easier down the road. It’s a must. Great questions, Brian. I agree that couples really need to sit-down and discuss money prior to to marriage and unfortunately I don’t think that happens very often. It always shocks and saddens me how many couples have never discussed money or shared goals before they meet with me. Many times they are even unconsciously working against each other because they didn’t communicate with one another. Money transparency is so important to building a strong, happy marriage. “…working against one another…” Been there…That’s not a pretty picture. It’s much better to be going in the same direction. This is a great list Brian!! 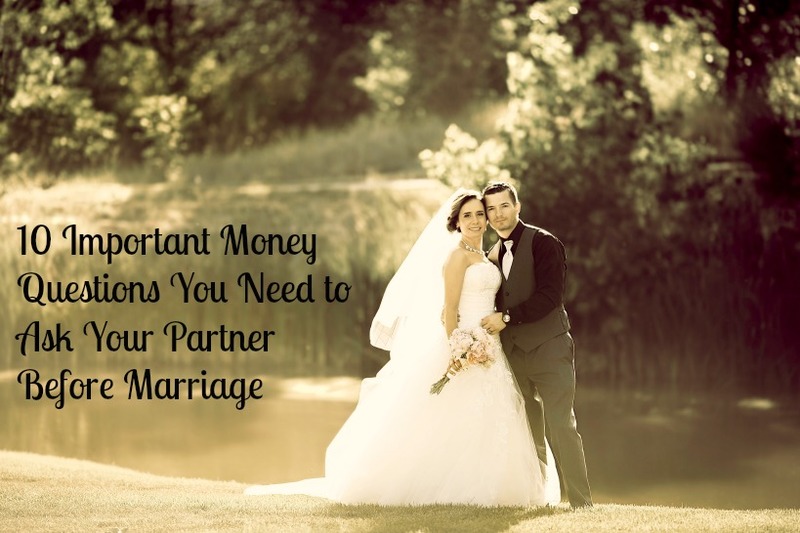 My husband and I never really discussed money much when we were dating and while money was not a big issue in our marriage, we definitely could have managed it better together. As a financial planner, though, I see SO many challenges with my clients, especially those who never had a money conversation. I love that as we work together, though, they feel less stress in their marriage as their money communications grow. “…less stress…” Money surely brings that. At first talking about money might increase stress as couples work through issues. In the end though the discussions will help minimize the stress as both get on the same page. My husband and I have been married 10 years and we are only recently on the same page in terms of finances. I am the natural spender and he the saver. We took pre-marital counselling but I think we were too young and immature to answer the questions about ourselves honestly. It’s taken some major give and take and bad choices for us to figure things out. I especially agree that finding out the family background of your future spouse is important – I grew up with no emphasis on saving or thriftiness and it really showed. I’m just thankful that my husband and I were able to work through the differences in a loving and patient way and that we’re now stronger for it. Thanks for sharing that Kristen. It’s real encouraging to hear stories like this…of two people who chose to work through the challenges instead of taking the easy way out and separating. Fighting over money always seems to be the elephant in the room that no one wants to talk about – even though it will probably be the biggest strain on the relationship. These are all really good questions to ask. One other thing I’d recommend asking a potential spouse: What is your attitude towards work. I’ve heard a lot of horror stories ending badly about people getting married only to find out that their new wife plans to hang out at home all day doing nothing, or that their new husband plans to play video games instead of looking for a job. Setting some expectations right from the beginning could go a long ways. My brother got dinged real good on this, MMD. When he married his first wife she worked for about the first 6 months, but then sat at home watching TV all night and sleeping until almost noon each day. They divorced, but I guess in his second marriage he figured it was his turn because his wife worked but he couldn’t hold a job.